Four Terrific New Releases, a New Stormy Night Author, and an Awesome Sale! Our new releases for you this week include blazing hot contemporary romance titles from Lily Harlem, Alexis Alvarez, and new SNP author K.C. Perrin along with an extra-naughty age play short story from Emily Tilton. A new section of Master of Her World is now available as well, and Renee Rose's excellent short story The Alpha's Punishment remains free on Amazon for the next couple of days. Last but definitely not least, Amelia Smarts' highly enjoyable dark western romance Emma's Surrender is currently on sale for $0.99. After she is evicted by a sleazy landlord, Charlotte Harps is left homeless and desperate, but fate intervenes when Frederic Vandenburg—a man she has never met before—sees her sleeping on a park bench and offers her a place in his home until she can get back on her feet. Publisher’s Note: His House, His Rules includes spankings and sexual scenes. If such material offends you, please don’t buy this book. Also note that this book was previously self-published by the author with the title Discipline for Charlotte. Matters soon come to a head when Casey disregards one of Rhett’s rules and endangers herself in a risky attempt to get the best possible photograph, and before she knows it she finds herself over his knee for a long, hard spanking. When her reckless behavior continues, Casey quickly discovers that Rhett is more than ready to bare her bottom and punish her even more thoroughly. Though being chastised in such a humiliating fashion infuriates Casey, she cannot deny her body’s reaction to Rhett’s stern dominance, and when he takes her in his arms and shows her what it means to be properly claimed and mastered she is left utterly spent and satisfied. But when a vicious band of poachers puts Casey’s life in danger, will Rhett be able to protect her? 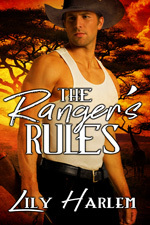 Publisher’s Note: The Ranger’s Rules contains spankings and sexual scenes. If such material offends you, please don’t buy this book. After she is caught loitering and taken into custody by the powerful corporation that all but runs her city, twenty-year-old Wendy Baskin is placed in a special program for wayward young women in need of reform. To ensure she receives the firm correction she needs, Wendy is sent to live with a couple who will act as her strict mommy and daddy during her stay with them. When she is caught breaking the rules her assigned guardians have set for her, Wendy quickly finds herself blushing crimson as she is given a humiliating chastisement, but the embarrassment of having her bare bottom soundly spanked is nothing compared to the shame she feels when her new mommy and daddy discover that she was deeply aroused by the punishment. As a result of her wanton behavior, Wendy is stripped naked and thoroughly inspected by her guardians, then informed that she will require the kind of training only the Institute can provide. Publisher’s Note: The Oak Street Method is a short story which is the first entry in the series The Institute: Naughty Little Girls. The books of this series share the same near-future setting as the books of The Institute Series, but they are stand-alone stories. The Oak Street Method includes spankings, sexual scenes, and age play. If such material offends you, please don't buy this book. Did you miss Chapters 5-8? You can find them in July 3rd's newsletter. A Strict Gentleman Takes a Top 100 Spot! Jaye Peaches' latest release, A Strict Gentleman, has reached the Top 100 in the Time Travel Romance category on Amazon! Congratulations, Jaye! Katie Douglas' newest release, Captured by the Highlanders, has made the Top 100 in the Historical Scottish Romance category on Amazon! Congratulations, Katie! Kara Kelley's thoroughly enjoyable book Taking in Dani has reached the #1 spot in Amazon Canada's Romance category and it is currently #6 overall among Kindle books on Amazon.ca! Congratulations, Kara!